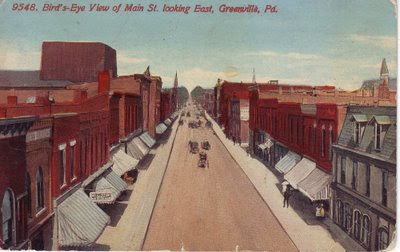 This lovely vintage postcard features a painted town view of the borough of Greenville in Mercer County, Pennsylvania entitled Bird's-Eye View of Main St. looking East. The postcard was published by the Chicago-based Acmegraph Company, which despite a relatively brief period of activity from 1908-1918, issued an extensive range of US national view-cards. This particular view is numbered 9548. It was posted to Carson City, Michigan from Greenville on 5 January, 1914.